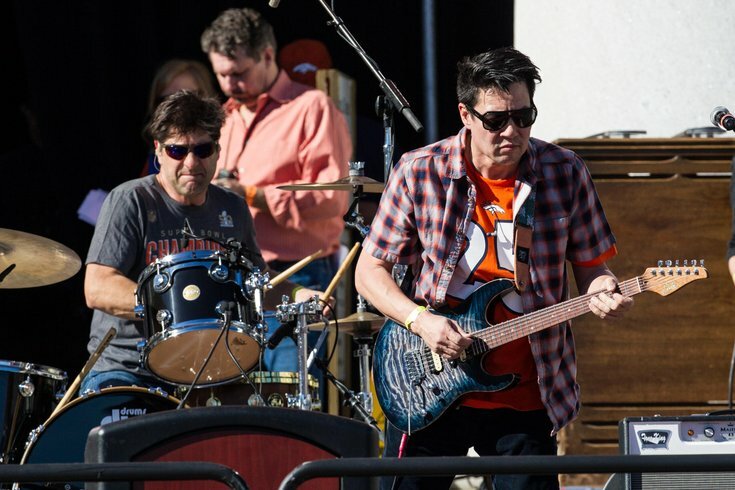 Members of the musical group Big Head Todd and the Monsters perform as part of the Denver Broncos championship parade at Civic Center Park on Feb. 9, 2016. Big Head Todd and the Monsters has never been known for big riffs. The veteran jam band has a fan base which appreciates its amalgam of rock, blues and a bit of jazz tossed in for good measure. However, Big Head Todd is headbanging, and appears to be preparing for a date on the Monsters of Rock tour, if that jaunt ever resurfaces. The band's latest album, "New World Arisin," is more muscular than just about anything the act has recorded during its 30-plus-year run. "It's good to make changes," vocalist-guitarist Todd Mohr said while calling from Chicago, Ill.
"You don't want to do the same thing every time out. I know that's the way it is for me. Everybody in the band wanted to make a hard rock album. It was that simple." Mohr, 52, grew up on the sounds of Led Zeppelin and Jimi Hendrix while coming of age in Denver, Colo. during the 70s. "When I was a kid, that kind of music and metal was a rite of passage for boys," Mohr said. "But it never completely left me. It's cool how it has resurfaced after lying dormant for so many years." Mohr graduated to blues and R&B when he hit his late teens. He formed Big Head Todd and the Monsters during his early 20s and has often mixed rock with blues and a hint of jazz. "That's what I was feeling at the time," Mohr said. "We've always been true to ourselves in this band. We never played anything that we weren't into playing. The cool thing about what we're doing now is that it happened organically." Big Head Todd and the Monsters, who perform tomorrow night at the Theater of Living Arts, aren't trying to fill a hole in the market, but they are cognizant that hard rock isn't as ubiquitous as it was a generation ago. "There is a gaping hole where hard rock used to be," Mohr said. "There's no doubt about that. It's not something we're thinking about. We just made this album for ourselves. We made something heavy that's also a little bit funky. We're just going through this journey right now. We do what we want." Not pandering and playing only what they want has probably kept the band together. "I think there's something to that," Mohr said. "Not everybody at our label [was] crazy about us making eclectic music, but that's who we are. If we tried to write hits, we would have broken up years ago. But we want the same things, so we're around all of these years later." Mohr has been flanked by bassist Rob Squires and drummer Brian Nevin since the group formed in 1986. "There's something about having that connection," Mohr said. "We're not just bandmates, but we're also really good friends. I think that can make a band better. I believe that's so for us." Big Head Todd and the Monsters appears Friday, Jan. 26 at the Theater of Living Arts, 334 South St., Philadelphia. Tickets are $35. Show time is 8 p.m.